At Moxxie Marketing, we believe in tailoring our clients needs with the right solutions. We work diligently to create the most common sense and financially manageable options for each client on a singular level. What is right for one business isn’t the right option for all businesses. Our in-house design team, photographers, videographers, writers and sales team make Moxxie Marketing a full marketing and design firm. Check out some of the clients we work with below. 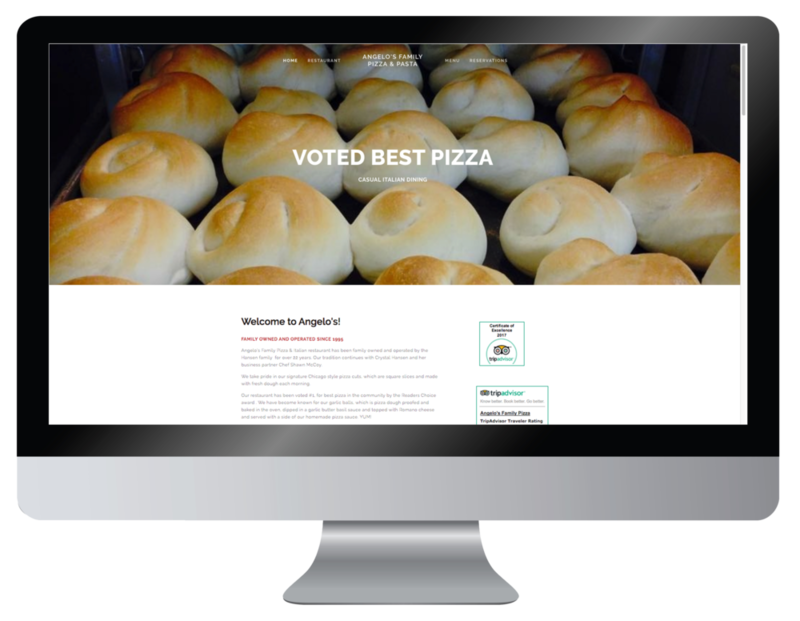 The owners of Angelo’s Pizza in Waynesville, NC contracted Moxxie Marketing for a new, up-to- date website, new business card design as well as a full menu redesign. We love working with Crystal and Shawn and continue to work with them on small projects that arise with their family owned restaurant. Like many of our other clients, The Hot Tub Store was bought by a new owner and he knew that the entire business needed a face lift. After meeting with our team at Moxxie Marketing, the new owner decided to hire Moxxie as his marketing firm. Beginning with a brand new logo, website design and business cards, we now manage The Hot Tub Store social media and google campaigns. Part of the Moxxie Marketing Tool Box is our in-house design team. From logo design, website design to rack cards and print publications, we do it all. We love working with Mountain Favors on their gift basket marketing brochures. For a closer look, check them out below. Joe Sam Queen has been a long time client of Nikki White’s. He chose to work with Nikki when she was working for marketing corporations and was happy and excited to continue working with Nikki when she opened her own Marketing Firm. Joe Sam Queen is a pillar in the Haywood County community and is currently running for the NC House position in the 118th District. Springdale Country Club came under new ownership in 2018. The new owners knew that the property and its image had to be brought up to date. With a few meetings and emails, Springdale chose Moxxie Marketing. We spent several months rebuilding a new website for Springdale, taking videos and photos of the property and implementing it all into what Springdale is today. We continue to work closely with Springdale in their seasonal marketing needs. Danny excitedly approached Moxxie Marketing when he decided to run for County Commissioner in Haywood County in 2018. He knew about our firm and our reputation in the community, as well as our relationship with other county officials. We began with creating a website for Danny’s campaign and then launched a hyper target social media campaign on Facebook. We also spent time recording and making testimonial video clips for Danny that can be found on his website and Facebook pages. Ellie’s Fine Resale is a small boutique with big style, located in downtown Waynesville on Main Street. Purchased in the summer of 2018, the mother daughter team reached out to Moxxie Marketing asking for a simple sit down to learn more about their marketing options. Within the first 20 minutes of meeting together, Carole and Christy stated they wanted to be a part of everything Moxxie and Discover Haywood was doing. We began working with these ladies to design a simple website for their new image. We now work closely with them as members of Discover Haywood and act as consultants for their marketing needs. Haywood Rentals is one of the largest property rental firms in Haywood County and was a client of Nikki’s before she became a business owner. The rental firm followed Nikki when she opened Moxxie Marketing and has been with her for more than 5 years collectively. We work directly with the owner of the rental property firm and have been influential in his marketing, both print and digital decisions for years. Suzanne approached Moxxie Marketing for some coaching in how to move forward in starting her massage therapy business. Her goals were to provide clients with a way to book their massage times online as well as sharing information to the community about Jin Shin Jyutsu. We began our relationship by creating a website for Suzanne and we continue to teach and train and empower her as she moves forward in her new business endeavor. Elk Country Realty is one of our premier clients. Beginning with designing a brand new logo for them, we are proud to have Elk Country working with us through the Discover Haywood platform and more. We speak with our clients weekly, if not bi-weekly about our marketing campaigns and strategies. Jim and Connie are absolutely amazing people and we love that they chose Moxxie Marketing to team up with for their marketing and development needs. The Cookie Queen came to Moxxie Marketing when she decided to take the leap of faith and kick off her business. We were stoked that she chose our firm to create her business logo and website. If you are looking for something sweet and decorative to celebrate a special event, make sure to contact Haywood County’s, The Cookie Queen. Goblin Lane has been a client of Moxxie Marketing when she was the owner of Ellie’s Fine Resale on Main Street. When Bab’s decided to open a second store front, she reached out to our team at Moxxie for help. Our experience with Bab’s has been a wonderful one and we love having her on board with us and as a part of the Discover Haywood platform. We hope you like her website and when you are in town, we encourage you to stop by and say hello.